Serious Note: I have huge frustrations with this lanuage. I have three different learn korean books and all three of them contradict eachother. There are multiple ways to say certain things, I will not always give you all of them, but they SHOULD all be correct. 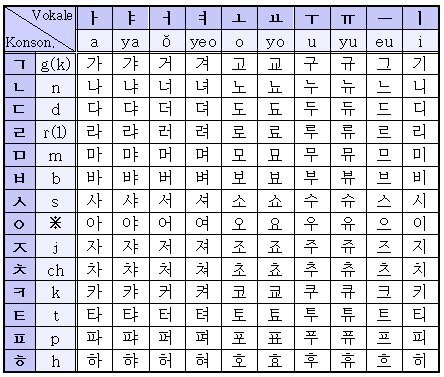 Also, some hangul symbols above, like the ones for b and p- though they have two different symbols, might me romanized differently based on sound. Example: 비 is Bi- but is pronounced like Pi (pee). ‘Lesson’ 1: Yes, No, Name, This Week, Today, Tomorrow, Yesterday, Who, What, Where, When, Never Mind, and some others.